At the end of an earlier post entitled "The Chickens-and-Rabbits Problem," I tickled readers whether the following question could be solved using the Singapore model method, or the Sakamoto method. Mr. Yan has almost twice as many chickens as cows. The total number of legs and heads is 184. How many cows are there? On his "Johnny and Mary Do Maths" blog, Chris Patterson followed up with an algebraic solution to the word problem in a post entitled Visualisation versus Algebra?. He asked me whether I have a visual proof to the question, particularly one using the Sakamoto method. I'm not sure whether I've succeeded in answering Chris's question, but here are three quick-and-dirty non-algebraic attempts to the chickens-and-cows problem. A quick check shows that for other integral values of ▌other than 1, 11 units cannot be an integer. Hence, Mr. Yan has 33 chickens and 17 cows. As a student of the Singapore model method, still trying to learn how to make wise use of this visualization strategy, especially when it lends itself well to a particular word problem, I would like to hear from members of the Singapore mathematical brethren about their alternative models in solving this chickens-and-cows problem, assuming that we're discussing this question with a group of grade 5 or 6 students—with no knowledge of Diophantine equations or advanced algebraic techniques. Let ① represent the number of cows, and △ be a variable quantity that is much less than ①. So, there are 17 cows and 33 chickens. Unless there's a more elegant Sakamoto solution, I find that it doesn't differ much conceptually from its algebraic cousin. Suppose there were exactly twice as many chickens as cows. Then each group of 2 chickens and 1 cow would have a total of [(2 + 2 × 2) + (1 + 1 × 4)] = 11 legs and heads. 16 groups of 2 chickens and 1 cow would have a total of 16 × 11 = 176 legs and heads. How many chickens and cows have 8 legs and heads altogether? Clearly, 1 chicken and 1 cow have 8 legs and heads altogether. 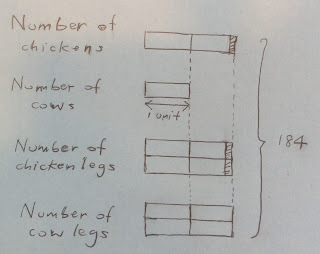 So, Mr. Yan has (16 × 1 + 1) = 17 cows and (16 × 2 + 1) = 33 chickens. With Chris's algebraic solution, we're sharing four methods of solution to the chickens-and-cows problem. Which method do you prefer? Which one would you use with your students? Share yours with the rest of us. © Yan Kow Cheong, April 24, 2013.